Sanya is the second largest city in Hainan province (Hainan being the biggest special economic zone in the country), and is in the middle of the south part of Hainan island. It&apos;s a transport and communication center, and one of the most important foreign trade ports in the extreme south of the golden coastline, which opens up to the outside world in the southeast of China. In addition, it is often considered China&apos;s "southern gate", and justifies its reputation as a vibrant subtropical oceanfront tourist city, so new on the International scene that much of it is still under construction. 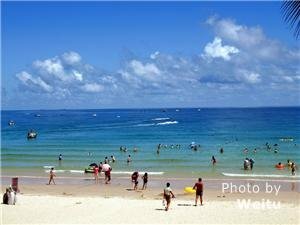 Sanya covers an area of 1,919 square kilometers and it has a population of ove 760,000.People from more than 20 nationalities, including Han, Li, Miao, and Hui, inhabit the city. There are altogether more than 463,700 people registered for permanent residence, among them 127,000 are permanent urban residents (as of 1998). Members of the Li nationality alone number 178,000 people living within the city. The city is ringed by continuous and rugged mountains on three sides. These are the Baopo Mountains in the north, the Dahui, Hubao and Gao Mountains (or just Gou Mountain - altitude 393 meters) in the east, and Nanbian Mountain in the south. This expansive mountain topography divides Sanya into many parts, all surrounded by green hills and characterized by multi-featured landscapes of many different styles. Seen from the sea, the mountains serve as a green protective screen which helps highlight the enchantment of Sanya city, as well as provide scenic overlooks out onto the vast sea, river, bay and city scenes. Facing the South Sea, there are a multitude of bays, each endowed with wonderful scenery. The Dadonghai, Xiaodonghai and Sanya bays in the urban area have the closest connection with the local citizens, while the Eastern and Western Islands serve as a gate facing the South Sea, and tend to add a sense of depth to this vast sea, and a veil of mystery when the sea fog cloaks the mountains. Strolling on the beach, one can often experience the Luhuitou through a light mist, as if the city were exhaling a long sinuous sigh. Sanya city, backed by its famous mountains and facing the sea, is a garden city full of coconut palms and other verdant splendors. Within the city is the Nanshan Buddhism Cultural Tourism Zone, with its wonderful sculptures of zoological and Buddhist themes, and the Tianyahaijiao Tourism Zone featuring a sculpture cluster of historical figures. In addition, Luhuitou Park contains life-like sculptures in human form that evoke the moving love story of "Luhuitou". Finally, there is the modern garden plaza which honors the national architect Luban Price. It also features sculpture clusters which help transport the visitor back to more ancient times in their imagination. There really is almost too much in all of these marvelous scenic spots to take in. Language： the language mainly used in Hainan is a dialect of Hainan, but the common language in the big cities like Haikou, Sanya and Wuzhiushan is still Mandarin. Do not buy corals or entire natural tortoise shells as souvenirs, because it is against the law, and you are not allowed to carry them onboard. The ultraviolet radiation in Hainan Island is very strong, so remember to bring your sunglasses, sunscreen and umbrellas. It would be best to bring some medicine to avoid heat stroke, gastrointestinal disease and mosquito bites. Remember to bring swimming equipment, swimming suit, swimming cap and glasses. After having seafood, you’d better not go swimming within one hour. For some people who are allergic to any kind of food, please beware not to eat any, or it may cause seafood poisoning.